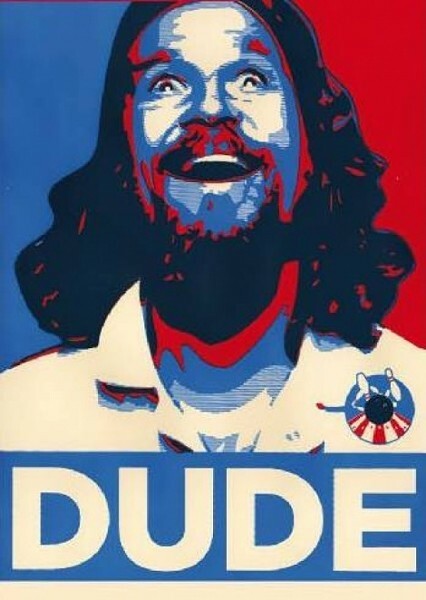 It’s hard to believe it’s been almost a dozen years since “The Dude”—bathrobe-clad and White Russian-sipping—first stumbled onto the screen in The Big Lebowski. Few films in recent memory have had a similar impact on pop culture to the degree that some devotees have the entire Coen Brothers’ dialogue memorized and a “Lebowski Fest” convenes each year in varying locales. The printmaking art lends itself to experimentation, and Signed & Numbered Gallery’s call for works on the Lebowski theme elicited more than 30 highly individualistic takes on a film that celebrates the individual. Not surprisingly, many of them are based on lines of dialogue, from Cerca de la Tierra’s birch panel “In Your Wisdom, Lord, You Took Him,” to Matt Lloyd’s purple, slinking bowling nemesis Jesus (“Let me tell you something, Pendejo”) to My Associate Cornelius’ “Walter Sobchack” in South Park-style exclaiming “You’re entering a world of pain.” The cultural cross-pollination continues with Ben Swift’s “Dude” in three colors resembling Shepard Fairey’s famous “Obey” image.